Bill Viola’s beautifully curated retrospective is laid across an intriguing labyrinth of dark rooms. You are lured in by the hypnotic rhythm of distant music or what is better described as distant vibrations. Viola is known for his slow moving, but somewhat addictive films, which have captured the imaginations of audiences worldwide. A contemporary American video artist, he is known for using innovative sound and imaging technology. He focuses on fundamental human experiences such as birth and death, transfiguration and consciousness, which make his work all the more evocative. The elements of fire and water are repetitively used in his work and bring intense emotional experience to his audience. This is illustrated by the popularity of his widely publicised film The Drowning Man. 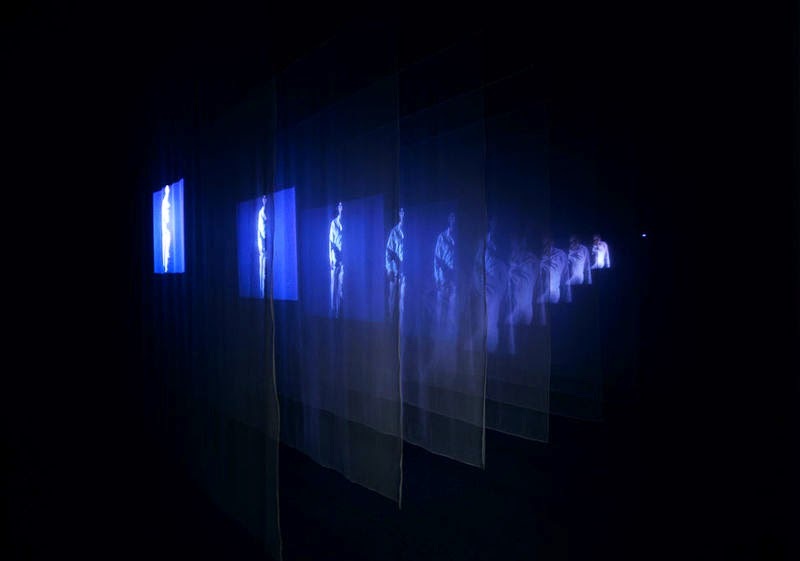 The exhibition opens with a projection of an ethereal figure drifting back and forth across an indistinguishable landscape at various depths of field. Progressively, it becomes clear that he is wandering through a desolate dessert scene at night. This is reminiscent of the cult Australian film Picnic at Hanging Rock, which haunted me as a child. When I was shown it, girls of a similar age to me were seemingly lost to an alternative dimension without explanation. I found this concept immeasurably frightening. In Viola’s film the diaphanous pyjamas worn by the subject and the close ups of the rippling linen were incredibly beautiful. As you watch the film you feel drawn into this solitary man’s journey, unable to abandon him as he suffers his hallucinations. The other particularly captivating film was The Encounter, in which two screens face each other at either end of the dark room and present two Indian men in modern dress, juxtaposed with two women in traditional saris. The sound of the desert wind as they walk towards and away from each other magnifies the evocative power of this film, which gives us a desperate sense of loss, when the subjects eventually leave the screen and we are excluded from their journey. In The Dreamers, there is a sense of calm which floods through you as you watch the subjects submerged in water as their hair and clothing pulse with its energy. This theme of nature's strength is also visible as water bursts through a suburban house in the Going forth by day: the deluge. Given Viola's religious beliefs, I wondered whether he was referencing the flood from the story of Noah and the Ark, God's ultimate condemnation of human sin. This film is shown in a large dark space, where the audience lie sprawled on the carpeted floor - bodies entwined for lack of space - to watch the events of four simultaneous films unfold. I can’t help but feel that Viola wanted to bring the audience together, thus provoking this physical contact between strangers as a form of social experiment. Either way, it seems that once again, art brings us together. As you descend the spiral stairs towards the key pieces, you unknowingly enter another work titled Presence, which consists of eerie whispers wrapping themselves around your being. It is deeply unsettling how much they feel like internal thoughts. You can look over your shoulder and search for speakers, but yet again you are powerless to his element of Viola's surprise. The key film was the incredibly spiritual Tristan’s Ascension, depicting a lifeless man lying still and gradually being drowned in cascading water. Slowly he rises up through the incredible force of it, but without movement or reaction. Perhaps this alludes to Jesus' silent suffering on the cross before he was raised to heaven in the resurrection. Not unsurprisingly given the brevity of the piece, it was originally created to accompany Wagner’s opera Tristan und Isolde. It is enthralling, because of the paradox of the man’s stillness with the unrivalled strength of the falling water, which seems to crush him before he is saved. We were spellbound by Viola’s vision.